Scientists have found a way to stop the spread of rice blast, a fungus that destroys up to 30% of the world's rice crop each year. An international team led by the University of Exeter showed that chemical genetic inhibition of a single protein in the fungus stops it spreading inside a rice leaf - leaving it trapped within a single plant cell. 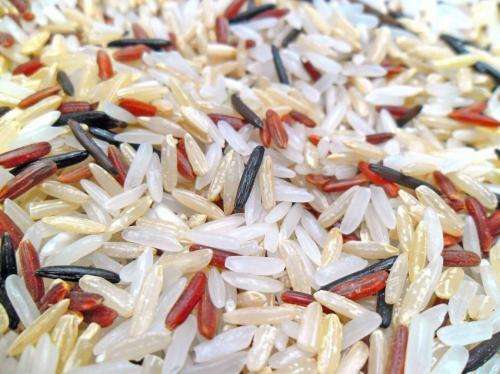 The finding is a breakthrough in terms of understanding rice blast, a disease that is hugely important in terms of global food security. However, the scientists caution that this is a "fundamental" discovery - not a cure that can yet be applied outside the laboratory. The research revealed how the fungus can manipulate and then squeeze through natural channels (called plasmodesmata) that exist between plant cells. "This is an exciting breakthrough because we have discovered how the fungus is able to move stealthily between rice cells, evading recognition by the plant immune system," said senior author Professor Nick Talbot FRS, of the University of Exeter. "It is clearly able to suppress immune responses at pit fields (groups of plasmodesmata), and also regulate its own severe constriction to squeeze itself through such a narrow space. "And all this is achieved by a single regulatory protein. It's a remarkable feat." Rice blast threatens global food security, destroying enough rice each year to feed 60 million people. It spreads within rice plants by invasive hyphae (branching filaments) which break through from cell to cell. In their bid to understand this process, the researchers used chemical genetics to mutate a signalling protein to make it susceptible to a specific drug. The protein, PMK1, is responsible for suppressing the rice's immunity and allowing the fungus to squeeze through pit fields - so, by inhibiting it, the researchers were able to trap the fungus within a cell. This level of precision led the team to discover that just one enzyme, called a MAP kinase, was responsible for regulating the invasive growth of rice blast. The research team hope this discovery will enable them to identify targets of this enzyme and thereby determine the molecular basis of this devastating disease. The research was led by Dr Wasin Sakulkoo, who recently received his PhD from Exeter. Dr Sakulkoo is a Halpin Scholar, a programme initiated by the generosity of Exeter alumni Les and Claire Halpin, which funds students from rice-growing regions of the world to study with Professor Talbot's research group. Dr Sakulkoo is from Thailand, and has returned home to a new position in industry following graduation.